Think piano and the name Peugeot doesn’t immediately spring to mind. However, the French company known primarily for its cars has an active design laboratory, and it’s here where a piano-loving designer teamed up with French piano manufacturer Pleyel to design a revolutionary baby grand piano. Piano design hasn’t radically changed much in a hundred years or more, but Peugeot had an idea to create a piano that allowed the pianist to be more ‘at one’ with the instrument, while at the same time offering better views for an audience. The baby grand shares similarities with the more usual form factor of a grand piano, but the keys and mechanism now run along a near horizontal plane. Those who have played it, including pop artist Mika who gave an exclusive concert to debut the piano, say that the sound is much more dynamic and precise, and it even alters the way they play and interact with the instrument. The silhouette is similar to that of the hull of a boat and is supported by a single leg. It’s constructed from wood, with the leg and lid made from carbon fibre to improve sound resonance. 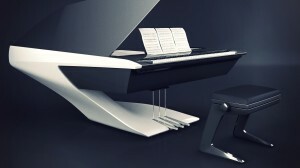 Initially thought impossible to design and build, the piano eventually became a reality. Take a look at the videos on Peugeot’s web site for an interesting overview of the process, plus highlights of Mika’s exclusive concert.